5 bedroom, 3 bathroom villa in the Highlands Reserve Golf & Country Club community. Owned by Penny Owens. Ref: 3483. • Large 30' by 15' pool with extended paved area with a planted tropical backdrop for extra privacy. • Large Games Room with pool table, table tennis table, air hockey and magnetic darts. • Well equipped kitchen and laundry room with everything you might need. Luxury villas do not come any better than our spacious executive villa. Situated in a quiet close of executive villas that is set within a championship 18 hole golf course at the prestigious Highlands Reserve Golf & Country Club on Hwy 27, just 2 miles south of US highway 192. Surrounded by trees and a National Park Reserve, the location offers a beautiful and relaxing base for your holiday, yet it is still only 15 minutes from Disney. A large Publix supermarket, cash machines, bank,shops and restaurants(including Applebees) are all very close by. A Walmart is only a short distance away. Our fully air-conditioned villa has 3000sq ft of spacious accommodation with upgrades throughout, including a large 30ft by 15ft pool with extended screened paved pool area with planted tropical backdrop. The spacious lounge, featuring a cathedral ceiling offers a relaxing central area for everyone to meet and relax together. The 65in smart flat HDTV and HD package includes HBO movies and sports (with NFL&Premiership football) DVR, DVD, video and music system. A wide selection of films and cds are also provided along with 2 ipod stations. There is a separate sitting room for relaxing in with a 40in flatscreen TV with PS2 and games and a formal dining area overlooking the pool. The kitchen and laundry room are both well equipped with everything you might need on holiday. Situated away from the other bedrooms the huge King Master bedroom is extended(16ft x 27ft) with its own separate seating area. It has spacious en suite with corner bath and separate double walk in shower. The Master bedroom also has 55in LCD TV with upgraded cable package with sofa and desk. I phone docking station. Free Wi-Fi Broadband connection for those who need to keep in touch and a printer for printing out directions and park times for attractions. There is a 2nd Queen Master en suite with 30in LCD TV. There are 3 further large bedrooms. Bedroom 3 has a double and a single bed with 42in LCD TV and bedrooms 4 and 5 have two twin beds in each. All have large TVs, DVDs, built in wardrobes and 3rd bathroom with bath/shower. There is plenty of room on the extended pool area for everyone to enjoy the sun all day long and a covered patio area allowing you to dine shaded from the sun. 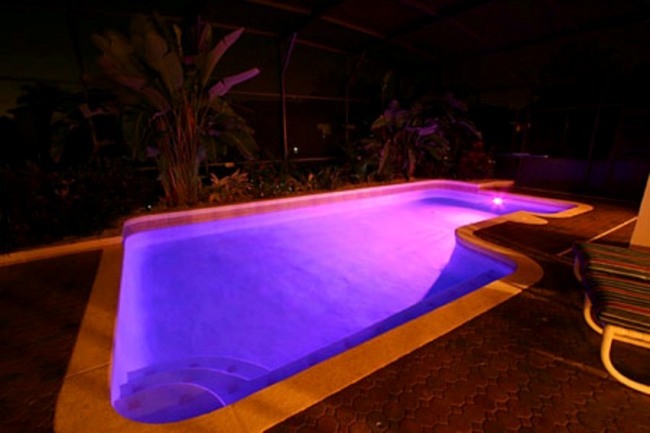 At night the pool has multi-coloured mood lighting. The pool has a removable child safety barrier and all doors to the pool are alarmed. For your peace of mind we have an ADT monitored alarm system and safe. There is a large games room with pool table, table tennis and air hockey and a music system. There is an outside BBQ area with a large gas BBQ and tennis rackets available for the tennis courts. Golf clubs are available for a small extra charge. Sat Nav available for small charge. The villa is ideally placed for you to take advantage of the club house and residents facilities:tennis courts, Kids play area and 20mtr pool. 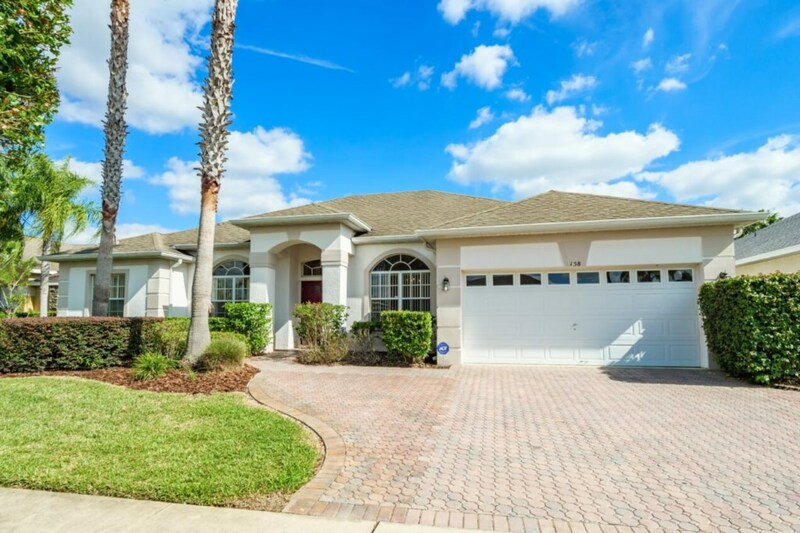 Highlands is a prime location and close to Disney. Our agents are based on site and are available 24 hours giving you that extra assurance that everything is provided to ensure you have a holiday of a lifetime. Low season prices from $1050.00 / £675.00 per week. Peak season prices from $1320.00 / £850.00 per week. 29 Aug 2019 to 07 Sep 2019 - use the form below to enquire about these dates. Your enquiry will be sent to villa ref 3483 only. This page has been viewed 9160 times since 18 May 2011.